Your Silk Road Adventure - HISTORY'S HISTORIESYou are history. We are the future. Use the distances and notes below to plan and budget your trip. In order to budget properly, you need to know how many miles you will travel between each stop and what type of transportation is needed. Keep track of your miles between stops and your total miles traveled. Knowing those two things will help you budget your daily and overall expenses. Camels average 18 miles per day. Dhows average 90 miles per day. To find out how many days it will take you to get to your next destination, divide the total number of miles by the miles per day you can travel. For instance, if you needed to travel 1000 miles and were traveling by camel you would divide 1000 by 18: 1000/18 = 55. 5 days. If you traveled the same distance by boat (1000/90) you would make the journey in just over 11 days. All expenses are paid in Caravan Coins and MUST be deducted from your total. * If you have purchased security or stayed in a caravansary on the day prior to a bandit attack, and if those expenses are accounted for in your passport budget, you can avoid financial loss. For your Silk Road adventure, you and your caravan members will need to create a budget. Budgeting may be one of the more difficult skills you will master – and one of the more useful. To be successful, your budget will need a frequent and careful review of your daily and weekly expenses. In addition to your expenses, you will need to record the income you receive from selling your trade goods in your Silk Road Passport. As a Silk Road trader, your motive is profit. 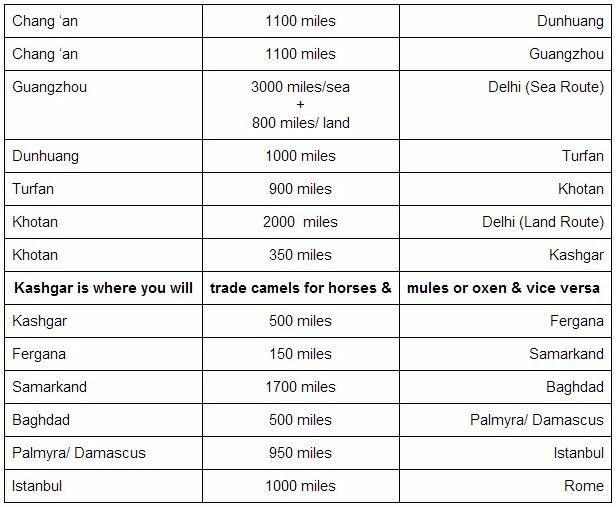 However, along our Silk Road there are specified exchange rates for your trade goods. Please note that you and your partners may supplement your income by completing activities and creating souvenirs to sell along the way. 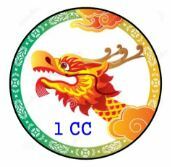 Our Silk Road currency is the Caravan Coin. All expenses result in a deduction from your overall total. Expenses include daily costs such as payments for guides and security, overnight stays at caravansaries, and food and water. Expenses also include losses due to theft and natural disasters such as sand storms, floods, and earthquakes. Income is added as a result of successful trades at your stops along the Silk Road. Income from a successful trade may only be added upon completion of your stop in each zone. Of course, the longer it takes your caravan to complete the assigned tasks for each stop, the higher your expenses will be. Profit equals income minus expenses. Your travel expenses – barring losses due to thievery or natural disasters – are one-time expenses for your trip. However, you may need to change modes of transportation along your route. There is a 5% reduction in value for every 1000 miles traveled. How many camels will you need? It depends on how much you need to carry and on whether you are walking or riding. If you choose to walk, of course your camel can carry more goods. However, your rate of travel slows by 2/3. So, instead of traveling 18 miles per day, your team will only be able to advance at 6 miles per day. Your camel can carry around 600 pounds. Even after factoring in your own weight, that still leaves room for a lot of trade goods. But, don’t forget about food and water. Any good caravan guide will tell you that if you want to survive a desert trek you will need to drink about 8 liters of water per day. For a 50 day trek through the desert, that is 400 liters, and that equals over 800 pounds of water. That is per person! Now, how many camels will you need to begin your journey? Oxen are usually teamed in pairs and average about 2 miles per hour but, because they need to be fed and rested frequently, only manage to cover around 10 miles per day. That is only 1/2 the distance – on average – that a camel can travel each day. Though it is slow going, a team of oxen can pull roughly their own weight. That means that a pair can pull about 2400 pounds – that is 4 times the amount of a single camel. Of course, you must factor the weight of the cart into the equation. Count on your ox-cart weighing 800 pounds. How many team of oxen will you need? To figure out your daily expenses you need to know the distance between stops and how far your transportation is able to carry you each day. You can hire or fire security and choose to stay at a caravansary on a daily basis but, in the event of a bandit or pirate attack, security must be in place prior to the attack in order to avoid losses. Before beginning your journey, you need to account for your travel expenses. After that, you need to account for your daily expenses. That means that until you make your first trade, you are losing money. That does not mean that you need to trade all of your goods at each spot, however. Things to consider: 1) All members of your caravan do not need to purchase the same goods. In today’s stock markets, a diverse portfolio helps guard against the risks of investing and is highly recommended. 2) If your budget allows it, after purchasing goods at your new destination, you may decide to carry some of your original goods to your next stop in an effort to increase your profit. You must consider, however, that the risk of losing your assets may increase in proportion to the amount of time you hold onto them. If you find yourself running short of cash, you may sell some or all of your goods at any time between stops. Kashgar: Wares might include everything from basic home supplies to “miracle cures.” However, Kashgar merchants were especially well known for their trade in pack-animals, tea, dried fruit, and medicinal herbs. This is where you may decide to trade camels for oxen (if you are heading west, or oxen for camels (if you are heading east). Baghdad: Renowned for its “Library,” often referred to as the “House of Wisdom,” important discoveries in mathematics and the sciences began here.